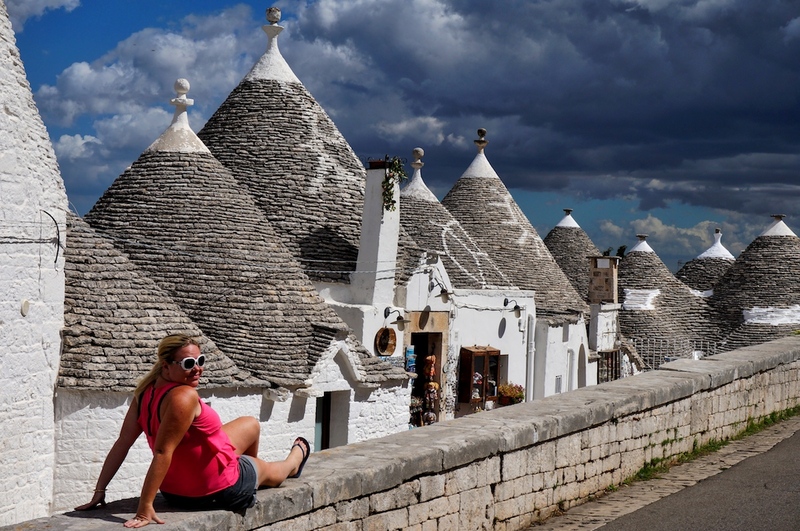 Still recovering from the insanely scenic sunrise in Matera, we headed back on the road in pursuit of our next Italian scalp – the famed trulli houses in Alberobello. This town is situated in the most eastern region in Italy, known as Puglia. For the geographically-challenged, that’s the “heel” part of this the boot-shaped country. Once we met up with Erin’s parents, we stopped at a café to catch our breath and for a peach melba that was worthy of a photo. 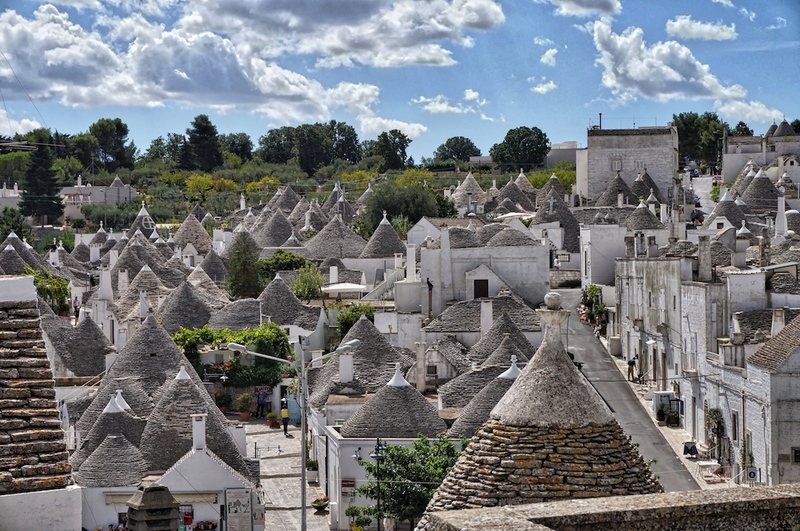 Although trulli houses are scattered throughout the region and around Alberobello, there is a particularly high concentration in one area just a short walk from the centre of town. This has been a UNESCO World Heritage site since 1996. You could be mistaken for thinking that gnomes live in these cone-shaped dwellings, but we didn’t spot any. Rather they are strewn with tourist shops offering a strange variety of knick knacks from new age crystals to cheap, plastic Chinese-made kids toys. Nevertheless it was a delight to walk through the streets and admire the unique architecture and soak up the Italian vibe. Erin’s parents bought Mia and Caius cute wooden slide whistles and they tooted to their hearts content. Heading back to the car, we continued north onto the Molfetta Outlet Mall a short drive away and stopped for lunch. It seemed strangely deserted there and we didn’t do any shopping, but grabbed a bite to eat and trucked on. 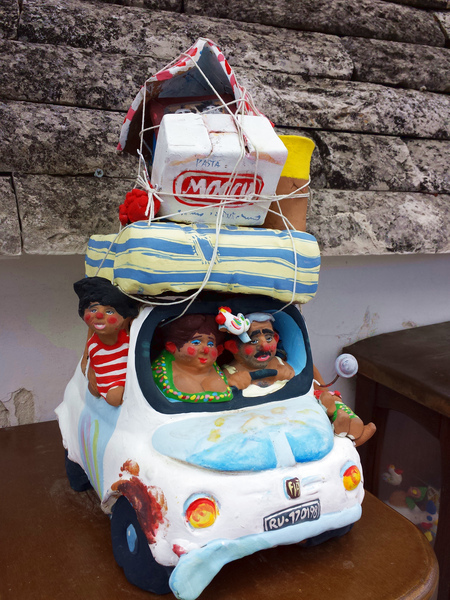 Later that afternoon we reached our hotel in Termoli for our overnight pitstop. Exhausted from a long day in the car, we ate a glamorous dinner of ham sandwiches in the hotel room. The following morning, breakfast at the hotel was surprisingly tasty and after checking out, continued further up the eastern Italian coast. We had intended to catch Erin’s parents for lunch but failed to meet each other at the planned location so we just made a couple of Vegemite sandwiches and drove onto our hotel in Perugia. 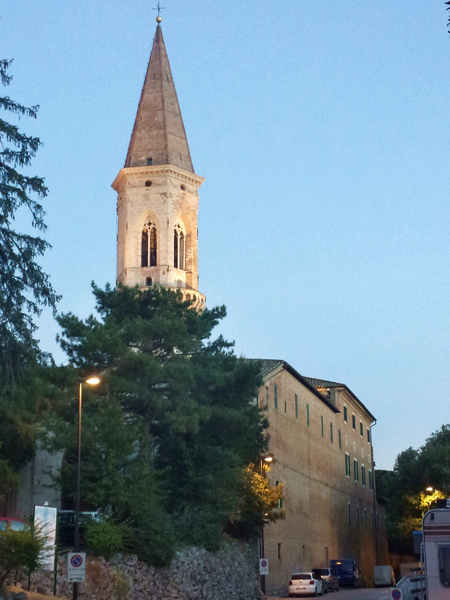 After checking in, we finally met Erin’s parents at their hotel and drove into the centre of town in Perugia for a pleasant evening stroll and dinner of classic Italian fare. Perugia is known as the home town of famed Renaissance artist, Raphael, and for manufacturing and exporting Baci chocolate. We covered 3 Italian towns in 2 days and had even more adventures in store at our next road trip stop – Florence. It's always nice to see people enjoying somewhere I pretty much consider a second after having spent about 6 months there in total over the past year or two. Adorable photos! I bet the food was divine. Italy is my favourite country (not least for the eating). 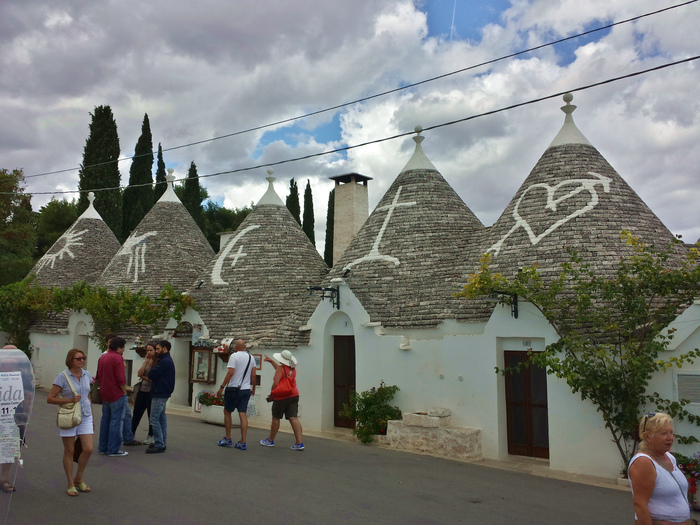 We visited Alberobello during a stop in Bari on our cruise this summer-- such a fascinating place! Wonderful photos! Reminds me of our own road trip through Italy. We loved that country, so many things to see. Incredibly beautiful!